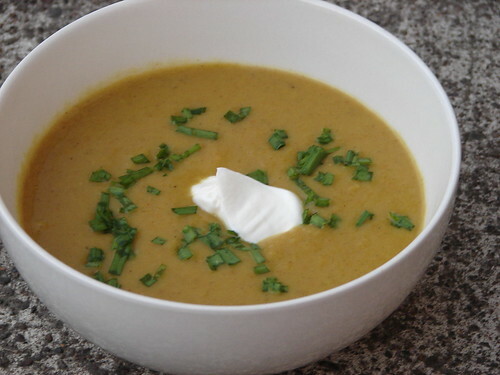 Make sure to blend the soup very well in order to achieve a smooth texture. We found that adding a little balsamic vinegar as well as some citrus juice (we used grapefruit) compliments the flavor of the peppers well. 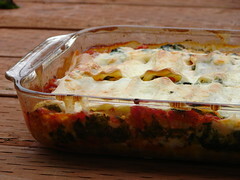 Serve with some additional sour cream and a nice hearty bread. they take on a much sweeter taste and they lend their characteristic flavor in this soup. We used red peppers here, but you could of course use yellow, orange or a combination thereof. Sautee onion, carrot and celery in some olive oil for about 10 minutes. Add the potato and the spices/herbs and sautee for another 10 minutes. De-glaze the pan with some brandy or white wine/dry vermouth. 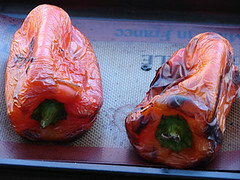 Add the roasted pepper and the blanched tomato, sautee for another few minutes. Add the broth/water and bullion cubes and let come to a boil. Simmer for a few minutes or until very soft. 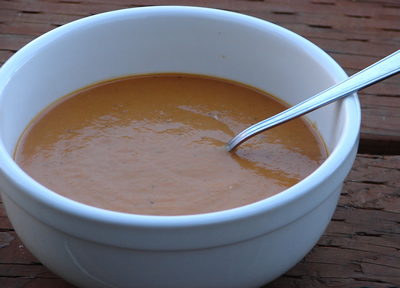 When the soup looks almost ready, blend it completely to achieve a very smooth texture. Bring the soup back to the pan and taste off with balsamic vinegar and citrus juice. Add some sour ream or half-and-half, whisk well. Salt and pepper to taste and serve.